Anti-racist educational workshops delivered to a series of Inverclyde schools. 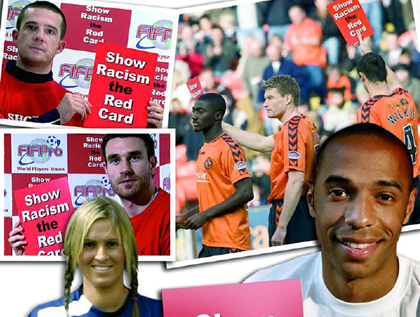 Show Racism the Red Card in partnership with Inverclyde Council undertook a series of anti-racist educational workshops in 24 schools in the Inverclyde Council area between January and March 2009. To familiarise young people with the causes, consequences and forms of racism and equip them with a range of skills that will enable them to challenge racism. To enable young people to develop good relationships and respect the differences between people, regardless of a person’s race, ethnicity, nationality or religion. To help young people prepare to play an active role as citizens in a growing multi-racial society, and to prepare them for life experiences out with Scotland. To provide teachers with an easy-to-use teaching resource to enable them to educate for the above. The anti-racist workshops were supplemented with an hours fun football coaching. It included emphasis on teamwork, healthy lifestyles and sportsmanship. The workshops and fun football coaching sessions were delivered by former professional footballer Derek Ferguson.